I’ve been interested in history since I was a little kid, don’t ask me why, it just happened. Later in life, while in the US Navy, history was ever present; so when teaching US history followed, it seemed like a natural fit. While getting serious about photography, it seemed a little more fun when shooting historical subjects. The problem is that not everybody cares about history (or photography for that matter), so the photo has to stand on its own. I’ve tried to put the photo in the forefront, then try to introduce a bit of limited back story in the comments, then many times provide link to more information for those who are interested. Even though the photograph is historical in nature, I try to limit the narrative so it’s not a lecture. I’ve been fortunate to have two photography lessons in my life, both were free by incredible photographers willing to share, and both lessons opened my eyes and rocked my little world. In the second lesson, I learned that when photographing something already popular, my photo needs to be different. No matter what I want to shoot, I need to ask myself, “what am I not seeing here?” It sounds incredibly simple but it really isn’t, at least for me, thank you again EM! Silently asking myself that question and discovering the answer do not always go hand in hand. In a recent trip I visited the USS Wisconsin (BB-64) at the Nauticas in Norfolk, Virginia. Instead of getting photos of the massive 16 inch guns, the bridge, or the wooden decks, I wanted to capture the immensity of the ship. You don’t always see a World War Two battleship with so much below the waterline showing so the bow seemed like the perfect place to start. 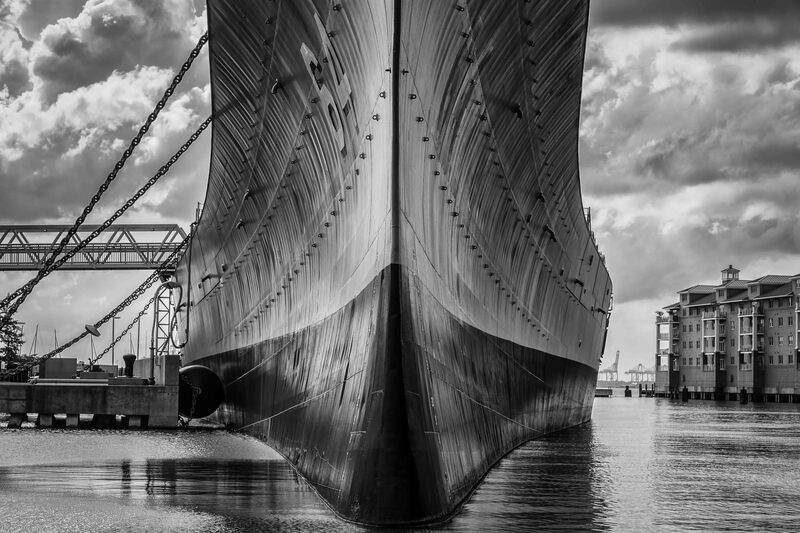 Going with a black and white photo could bring out the texture of the ship as well as the backdrop of clouds. The photo at the top of this blog is called “Wisky” because that was the Wisconsin’s nickname. While in Virginia, I couldn’t pass up going to Colonial Williamsburg either, an amazing place! I really didn’t plan on shooting indoors, and to my surprise, it didn’t cost anything to walk around the entire day with my camera. Without paying, there are a few buildings you can enter as well as the stores, talk about bang for the buck! In the photo at right, called Riders, I cropped out a few tourists hoping to give it a traditional colonial feel like we were stepping back in time. Street scenes like this are very common at Williamsburg, you just have to be ready. While there is history everywhere, the southwestern US is an amazing place. Recently I was reading about gunfighters and lawmen of the old west. I discovered that Sheriff Pat Garrett was buried an hour from my house in El Paso. Pat Garrett was famous for killing Billy the Kid in 1881 at Fort Sumner, New Mexico. However, the other part of the story is that Garrett later ran in to serious debt and was killed in 1908 on a back road near Las Cruses, New Mexico. The details of the killing are sketchy when it comes to who actually murdered Garrett. The photo to the left is called “Big Casino” because that was Garrett’s nickname. Oddly enough, Garrett and Billy the Kid played poker many times together and the Kid’s nickname was “Little Casino” at the tables because Garrett was a tall man compared to Billy the Kid. Throughout the American southwest are many Spanish missions, they are literally everywhere. I wrote earlier about the the El Paso Mission Trail and its three missions in a blog called Missions: 3 in 1 morning. However, the San Xavier del bac Mission in Tucson, Arizona is another that is worth seeing because not only is it beautiful on the inside, but the outside is incredible as well. The mission was built in the 18th century and is in incredible condition; however, it is in a constant state of preservation and many times you will find workers inside. This photo, on the right is called Spanish Dome and is just one example of the architecture of this building. There are many angles to shoot this from and they all seem different, including its one unfinished steeple. This mission is definitely worth the trip! Sometimes it’s fun to stumble on to history where and when you least expect it as was the case a few weeks ago. While at the El Paso Museum of Art and looking at the impressionists works, I noticed something familiar. Hanging on the wall was was a portrait that just about anybody would recognize. It was a Gilbert Stuart portrait of George Washington, the same portrait used for the one dollar bill! That’s right, if you’ve handled a one dollar note you’ve seen this! I figured this had to be a reproduction, nope; it was an original from 1796. 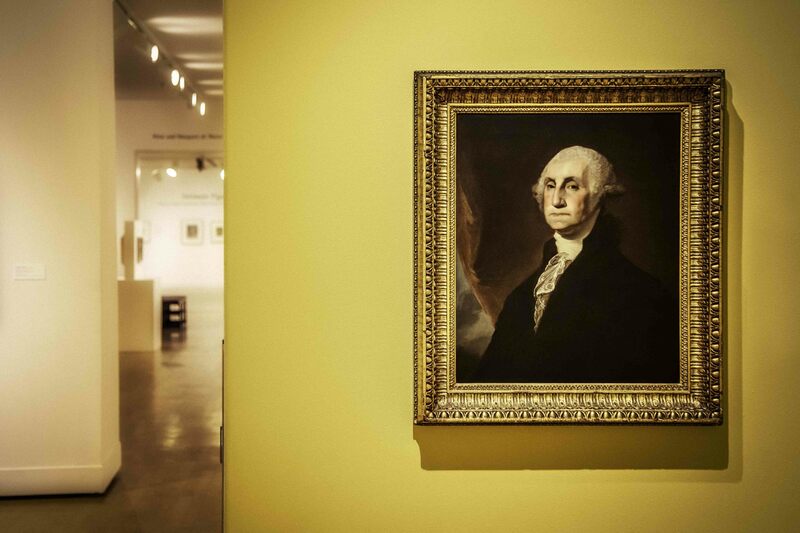 A Gilbert Stuart portrait of George Washington in the El Paso Museum of Art, now that IS cool! The trick here was how to take a photo of this very familiar image without making it appear to be just a photo of someone elses artwork. I took this photo, GW, wanting to partially show the hall, allude to the museum, and make it part of the story. This Stuart portrait ended up being a nice surprise for sure! The last photo at the bottom is the USS Cobia (SS-245) in Manitowoc, Wisconsin. The submarine was brought to Manitowoc when I was a kid in the early 1970’s. My brother and I bought summer passes to the Manitowoc Maritime Museum which has since relocated and is now the Wisconsin Maritime Museum at Manitowoc. Back then, our summer passes cost $5 and nobody, and I mean NOBODY, went on those early tours. Many times it was just my brother and I becoming regulars with the tour guides who let us explore. As a future history nut, this was about as good as it got! Although the sub a childhood novelty for us, this boat was serious business in its day completing six war patrols during WWII sinking over 16,000 tons of enemy shipping. After the war, Cobia was a training vessel for the US Navy until it was stricken from the Navy register and moved to Manitowoc. The reason for a submarine on Lake Michigan? During WWII the Manitowoc Shipbuilding Company built 28 submarines for the war effort and Cobia proudly represents that era. Finding historical subjects isn’t that difficult; however, trying to make them interesting can be… Honestly, I could write about history seemingly forever, that’s why I titled this US History 1, at some point I’m sure there’ll be US History 2. Things are perfect in my little corner of this universe when I can merge photography and history. Many times, history is about the journey and I can say the same about photography. Finding Gilbert Stuart’s George Washington portrait just 20 minutes down the road was nowhere near as fun as finding Sheriff Pat Garrett’s grave. On that day my kids and I went to the New Mexico Farm and Ranch Heritage Museum and ate at a great little Italian restaurant called Zeffiro Pizzeria Napoletana. While the photo is cool, that day with my kids was even better! Prev Post: New Peak Design Bags are out! Next Post: Interview #2 Crazy Mind!